William Bucklin, who arrived in 1630 in the Boston area of the Massachusetts Bay Colony, probably immigrated from Radipole in the Buckland Ripers area of Dorset, England. William was a shipbuilder, and knew the Dorset, England coast. The outside of the St. Nicholas Church in Buckland Ripers still looks much as it did in the 17th century, when William Bucklin left the area to go to New England. Buckland Ripers is a small village, now a score or so of houses, 2 miles south-west of Upwey, west of Broadwey, about a mile from Radipole, and 4 miles north-west of Weymouth, in Dorset. Radipole is on the River Wey, about 1½ miles from Weymouth. The adjacent parishes are: Broadwey, Buckland Ripers, Chickerell, Wyke Regis, Melcombe Regis and Preston. To the south of Radipole village is Radipole lake. Until the 19th century the lake was tidal (from the ocean via the river Wey) and was considerably larger than it is now. There is archeological evidence that the Romans used the Radipole area as a ship port, bring men and supplies to the area. The parish church of St Ann’s, of Radipole (formerly Wey) with the nearby manor house showing on the left of the photo. St. Ann’s is said to be the oldest building in the Weymouth area, dating from around 1250. The interior was heavily refurbished in the 19th century. 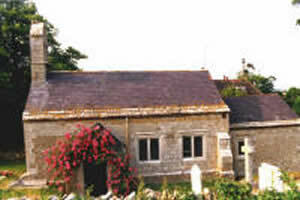 It is a pleasant building, and the churchyard is currently beautifully maintained. The graveyard has a possible connection to the Bucklin family. Regarding the “Buckland – Ripers” village name: The “Buckland” derives from the Old English bocland, meaning ‘charter land.” In early England, the theory was that all land was owned by the king, and he granted a specified “holding” to various nobles, that is: the right to “hold it for the king” in return for a pledge of loyalty and the furnishing of knights or other service. In short, “Bocland” indicated (1) a writing, and (2) payment of a rent of some sort. 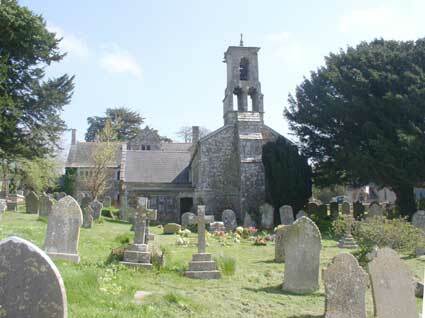 Buckland-Ripers is an old Manor, associated with much of the early history of England. Hutchins’s History of Dorset, relates that four Saxon knights owned the Manor in the time of King (Saint) Edward ‘the Confessor’, i.e., before the Norman invasion by William the Conqueror. The Dorset County web pages have an excellent short history of Buckland-Ripers. It notes that before 1500 the manor came into the possession of the De Ripariis (or Rivers) family and the second part of the village’s name is said to be derived from that ownership. Before the Normal invasion at least a good third of the land was owned by the Catholic Church. E.g., the area of present day Radipole was owned by the Abbey of Cerne. (1086) Original record or summary of William I the Conqueror’s survey of England. The most remarkable administrative feat of the Middle Ages, the survey was carried out, against popular resentment, by panels of commissioners who compiled accounts of the estates of the king and his tenants. As summarized in the Domesday Book, it now serves as the starting point for the history of most English towns and villages. Originally called “the description of England,” the name Domesday Book (a reference to doomsday, when people face a final accounting of their lives) was later popularly attached to it. THE WIFE OF HUGH fitzGrip holds MARTINSTOWN of the king. 9 thegns held it in parage TRE, and it paid geld for 6 hides. There is land for 6 ploughs. In demesne are 3 hides of this land, and there are 2 ploughs, and 5 slaves; and 17 bordars with 2 ploughs. There is a mill rendering 16d, and 13 acres of meadow, [and] pasture 9 furlongs long and 8 furlongs wide. It was worth 10l; now 6l. William holds FROME WHITFIELD of her. Godric held it TRE, and it paid geld for 4 hides. There is land for 3 ploughs. In demesne are 2 ploughs, with 1 slave, and 8 bordars and 4 cottars. There is a mill rendering 5s, and 30 acres of meadow, [and] pasture 4 furlongs long and 2 furlongs wide. It was worth 40s; now 4l. Roger holds ‘LITTLE CHESELBOURNE’ [in Puddletown] of the same woman. Ælfgar and Alstan held it TRE, and it paid geld for 2 hides. There is land for 2 ploughs. In demesne is 1 plough, with 6 bordars. There is a mill rendering 30d, and 5 acres of meadow and 1 furlong of pasture. It was worth 50s; now 25s. Hugh held this land of the Abbot of Abbotsbury, as his men say, but the abbot denies it. The woman herself holds BUCKLAND RIPERS. 4 thegns held it in parage TRE, and it paid geld for 4 hides. There is land for 3 ploughs. In demesne are 2 ploughs, with 1 slave; and 2 villans and 5 bordars with 1 plough. There is a mill rendering 20s, and 10 acres of meadow, [and] pasture 15 furlongs long and 1 furlong wide. It was and is worth 100s. She herself holds WEY [Broadwey or Upwey]. 9 thegns held it in parage TRE, and it paid geld for 4 hides and 1 virgate of land. There is land for 4 ploughs. In demesne are 2 ploughs, and 3 slaves, and 6 bordars. There are 3 mills rendering 35s, and meadow 9 furlongs long and 1 furlong wide, [and] pasture 3 furlongs long and 1 furlong wide. It was worth 6l; now 100s. She herself holds WEY [Broadwey or Upwey]. 5 thegns held it freely TRE, and it paid geld for 6 hides. There is land for 5 ploughs. In demesne are 2 ploughs, with 1 slave; and 1 villan and 10 bordars with 1 plough. There are 3 mills rendering 37s6d and 25 acres of meadow, [and] pasture 20 furlongs long and 3 furlongs wide. It was worth 7l; now 10l. AZO holds “WINTREBURNE” of her. Almær held it TRE, and it paid geld for 1 hide. There is land for half a plough. There are 2 bordars, and 1 acre of meadow and pasture 2 furlongs in length and 1 furlong wide. It is worth 10s. Hugh and William hold [?] WEST STAFFORD of her. 3 thegns held it in parage TRE as 2 manors, and it paid geld for 6 hides. There is land for 3 ploughs. In demesne are 2 ploughs, with 1 slave, and 8 bordars. There are 24 acres of meadow and 16 furlongs of pasture and 8 acres. It was worth 4l; now 70s. The woman herself holds “WINTREBURNE”. Alric held it TRE, and it paid geld for 8 hides. There is land for 4 ploughs. In demesne are 2 ploughs, and 3 slaves; and 3 villans and 5 bordars with half a plough. There are 9 acres of meadow and 200 acres of pasture. It was and is worth 6l. William holds MORDEN [Morden and East Morden] of her. Alnoth held it TRE, and it paid geld for 5 virgates of land. There is land for 1 plough. […] It was worth 25s; now 20s. She herself holds “WINTREBURNE”. 3 thegns held it TRE, and it paid geld for 5 hides. There is land for 3 ploughs. In demesne is 1 plough, and 2 slaves, and 5 villans and 4 bordars. There are 4 acres of meadow and pasture 5 furlongs in length and as much wide. It was worth 100s; now 40s. Ralph holds 1 ½ virgates of land in WINTERBORNE [?Muston] of her. There is land for 3 oxen. Godwine held it TRE, and it was and is worth 3s. William holds WIMBORNE [?St Giles] of her. Ealdwine held it TRE, and it paid geld for 1 hide. There is land for 1 plough. There are 2 bordars, and a third of a mill rendering 15d. There is pasture 4 furlongs in length and width, [and] woodland 1 furlong and half a furlong wide. It was worth 20s; now 5s. The same William holds HAMPRESTON of her. Æthelweard held it TRE, and it paid geld for 1 hide. There is land for 1 plough. There is 1 villan and 2 bordars, and 2 acres of meadow and woodland 1 furlong in length and another in width. It was and is worth 12s. William holds BERE REGIS of her. Leomer held it TRE, and it paid geld for half a hide. There is land for half a plough, which [half-plough] is there, and a mill rendering 20s, and 1 bordar, and 6 acres of meadow and 6 acres of pasture. It is worth 30s. William holds 1 ½ virgates of land of her. It renders 20s. Walter holds TURNERS PUDDLE of her. Gerling held it TRE, and it paid geld for 6 hides. There is land for 3 ploughs. In demesne are 2 ploughs, and 4 slaves; and 2 villans and 4 bordars with half a plough. There are 10 acres of meadow and 20 acres of woodland, [and] pasture 12 furlongs long and 6 wide. It was worth 3l; now 4l. Hugh holds WINTERBORNE HOUGHTON of her. Wulfgar held it TRE, and it paid geld for 2 hides and 1 virgate of land. There is land for 1 ½ ploughs. In demesne is 1 plough, with 1 slave; and 2 villans and 2 bordars with half a plough. There are 14 acres of scrubland pasture 6 furlongs in length and 6 in width. It was worth 20s; now 30s. With this manor the same Hugh holds 1 virgate of land unlawfully which belongs to William de Moyon. Hugh holds 1 virgate of land at BRIDGE of the same woman. There is land for 2 oxen, and there is 1 villan. It was and is worth 10s. William holds [Higher and Lower] STURTHILL of the same woman. Ælfric held it TRE, and it paid geld for 5 hides. There is land for 4 ploughs. In demesne are 2 ploughs, and 4 slaves; and 2 villans and 4 bordars with 1 ½ ploughs. There is a mill rendering 6s3d, and 27 acres of meadow, [and] pasture 4 furlongs long and 1 furlong wide. It was worth 4l; now 100s. William holds GRASTON of the same woman. Alweard held it TRE, and it paid geld for 2 ½ hides. There is land for 2 ploughs. In demesne is 1 plough, and 2 slaves; and 1 villan and 8 bordars with half a plough. There is a mill rendering 7s6d, and 16 acres of meadow. It was worth 40s; now 60s. Ilbert holds half a hide in FARNHAM of the same woman. There is land for half a plough, and yet there is 1 plough, and pasture 1 ½ furlongs in length and 1 furlong wide. It is worth 10s. Alwine held this land of the Church of Shaftesbury and he could not be separated from it. William holds PUNCKNOWLE of the same woman. Alweard held it TRE, and it paid geld for 5 hides. There is land for 4 ploughs. In demesne are 2 ploughs, and 4 slaves; and 4 villans and 5 bordars with 2 ploughs. There is a mill rendering 12s6d, and 35 acres of meadow, and 30 acres of woodland 3 furlongs of pasture. It was worth 60s; now 100s. The woman herself holds 2 hides in TATTON which were in the demesne of Cerne Abbey. TRE 2 thegns held them on lease. Hugh took these despite the abbot. It is worth 20s. Walter holds 1 hide at MATRAVERS of the same woman. 2 thegns held it TRE. There is land for 1 plough, which [plough] is there in demesne, with 1 slave and 1 villan and 4 bordars. There are 2 acres of meadow and 30 acres of pasture. It was worth 20s; now 30s. She herself holds half a hide in “TARENTE”. There is land for 1 plough. There is 1 villan and 1 bordar, and 2 acres of meadow and pasture 3 furlongs in length and 1 furlong wide. It is worth 10s. Robert holds DURWESTON of the same woman. Ælfric held it TRE, and it paid geld for 2 hides. There is land for 2 ploughs. In demesne is 1 plough, with 3 bordars. There are 8 acres of meadow, and pasture 4 furlongs in length and 2 furlongs in length [sic]. It was and is worth 40s. Robert holds QUARLESTON of the same woman. Godwine held it TRE, and it paid geld for 1 ½ hides. There is land for 1 ½ ploughs. In demesne is 1 plough, with 1 slave, and 4 bordars. There is a mill rendering 5s, 1 ½ furlongs of woodland pasture 3 furlongs in length and 1 furlong in width. It is worth 30s. In Quarleston Robert holds 1 hide and 1 virgate of land. In demesne is half a plough, with 1 bordar. It was worth 25s; now 20s. Ralph holds TARRANT [?Rawston] of the same woman. 1 thegn held it TRE, and it paid geld for 5 hides. There is land for 3 ploughs. In demesne is 1 plough, and 4 slaves; and 2 villans and 4 bordars with 1 plough. There is a mill rendering 30d , and 16 acres of meadow, [and] pasture 3 furlongs long and 2 furlongs wide and in another place 8 furlongs of pasture. It was worth 100s; now 4l. Berold holds TARRANT [?Gunville] of the same woman. 1 thegn held it TRE, and it paid geld for 1 hide and 3 virgates of land. There is land for 1 ½ ploughs. There are 3 bordars with 1 slave, and 7 acres of meadow, and pasture 2 furlongs in length and 2 wide. It was worth 40s; now 15s. She herself holds LANGTON HERRING. 1 thegn held it TRE, and it paid geld for 1 ½ hides. There is land for 3 ploughs. In demesne are 2 ploughs, with 1 slave; and 1 villan and 7 bordars with 1 plough. There are 4 acres of meadow and 40 acres of pasture. It was worth 30s; now 40s. Two knights hold half a hide in RUSHTON of the same woman. 3 thegns held it freely TRE, and it paid geld for as much. There is land for half a plough. There are 20 acres of meadow and 200 acres of pasture. It is worth 10s. Hugh holds WEST CHALDON of the same woman. 9 thegns held it in parage TRE, and it paid geld for 5 hides. There is land for 4 ploughs. In demesne are 2 ploughs, and 2 slaves; and 5 villans and 8 bordars with 2 ploughs. There are 3 acres of meadow, and pasture 7 furlongs in length and 5 furlongs in width. It was worth 10l; now 8l. Hugh holds RINGSTEAD of the same woman. Wulfnoth held it freely TRE, and it paid geld for 1 hide. There is land for 1 plough. There are 2 villans and 2 bordars, and 8 acres of meadow, and pasture 2 furlongs in length and 1 furlong in width. It was worth 30s; now 25s. Turold holds WARMWELL of the same woman. Almær held it TRE, and it paid geld for 1 ½ hides. There is land for 2 ploughs, which are there in demesne, and 5 bordars. There is a mill rendering 5s, [and] pasture half a league and 3 furlongs long and 3 furlongs wide. It was worth 30s; now 40s. Ralph holds RINGSTEAD of the same woman. Hunwine held it TRE, and it paid geld for 1 ½ hides. There is land for 2 ploughs. In demesne is 1 plough; and 1 villan and 3 bordars with half a plough, and 4 furlongs of pasture. It is worth 40s. This entry indicates that the land was held by the wife of Hugh FitzGrip, but during the time before the Norman Invasion of 1066, the land was held jointly by four thanes of King Enward. Thanes were nobles below the rank of earls who were local estate owners with at least 5 hides of land and a residence. Thanes were the backbone of the army of King Edward — as Knights were the backbone of the army of King William. The land of the manor of Bucklin Ripers is described as being 4 hides. A “hide” is an ancient Old English unit of land area, dating from perhaps the seventh century. The hide was the amount of land that could be cultivated by a single plowman and thus the amount of land necessary to support a family. Depending on local conditions, this could be as little as 60 acres or as much as 180 acres. The hide was more or less standardized as 120 acres after the Norman conquest of 1066. Thus, it would appear that although that before 1086 it was deemed that there was enough land to support the families of 4 plowmen, the enlarged Norman “hide” indicated that there only was enough land for 3 plowmens’ families, and indeed only 3 ploughs were on the manor. A furlong was generally about what we would describe as the length of 1/8 of a mile. Thus the description in the Domesday book of the pasture indicates a rather long and narrow strip of land. “Demense” was the part of the lord’s manorial lands reserved for his own use and not allocated to his serfs or freeholder tenants in return for their service. The suggestion from the compact description of the Doomsday Book is the freemen on the manor had about 2/3 of the manor land in exchange for their service. That brings us to the villans and boardars who seems to have had land for 1 plough. The “Villan” (aka villein) of Norman times was generally a freeman of the previous era of the Danish incursions, when freemen had to “commend” himself to a thegn who pledged him his protection in consideration of payment in a rendering of labour. Villans were the most numerous class of the Domesday, Survey, men who had sunk from freedom and to being bound both to soil and lord, but as yet preserving much of their older rights, retaining their cottage or other adjacent land, free as against all men but their lord, and still sending representatives to hundred-moot and shire-moot. They stood therefore far above the “landless man,” or slave. The “villein,” in the most common sense of the word, was bound only to gather in his lord’s harvest and to aid in the ploughing and sowing of autumn and Lent. Also, commonly the cottar and the bordar were bound to help in the work of the home-farm throughout the year, usually in exchange for being granted a cottage or the right to live in a cottage. However, other service could be the price paid by the villan or bordar. An obvious example is that in Buckland Ripers one of them might well have been obligated to do the work involved with the operation of the grain mill on the premises. The “Cottar” was essentially a villan who owned little land, perhaps only the cottage he lived in. The bordar was essentially a villan (that is a freeman) who owned no land but lived in a cottage. After the 1066 conquest Hugh FitzGrip became the Sheriff of Dorset, with a number of land holdings in Dorset. The Manor, though never very impressive, in 1086 probably only was the manor house, the surrounding land, buildings and workers, although it did include a mill and sufficient pasture for 200 sheep. The “Ripers” part of the Buckland Ripers manor name is an addition during the 1200’s, an era when holders of Bocland” added their surnames to area names to distinguish their holdings from those of others. In 1285, the Manor passed to the the family of de Riuers, also known as de Ripers and also de Ripariis (meaning “of the River). Thus the “bocland” became Buckland Ripers. By 1310 PETER de MALORE was living in the Manor. He ‘held half a knight’s fee’ together with ALIANOR de COLBERE, ‘relict of Robert de Colbere’. In other words – Peter and Robert’s widow held it jointly. (Peter may have been the great uncle of Thomas Mallory, the author of ‘Morte d’Arthur’.) Peter de Malore built the manor church and instated the first rector, a John Lawrence. By the kind permission of St. Nicholas Church. St. Nicolas Church, immediately next to the Manor House, has places for 100 person to sit. It’s existing written registers of events only date from 1665. However, various portions of the early medieval church still exist, for example the simple hexigonal stone baptistery appears to be of about the 1200 AD era. In the reign of Richard II, 1377, the estate passed to the Framptons. 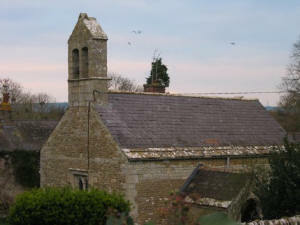 The Framptons (who became Lords of Moreton) have remained patrons of the church to the present day. In the chancel are two gravestones, one for James Frampton, Esqre., who died in 1631, and another for Jane, his former wife. Near the Font is another to the memory of John Scovil, who died in 1707. These gravestones are now covered by a tile flooring. The Framptons can be characterized in the turbulent times of the the early 1600’s as loyal nobles of the kings, and as Church of England supporters. E.g., the Framptons were part of the 2,000 or so assembled to fight for the King at the battle of Hambleton Hill, in Dorset; and the Framptons included the Bishop of the Church of England bishopric Gloucester. During the English Civil War, the Manor, its associated buildings and the church were partly destroyed about 1610 – 1615, perhaps by Cromwell’s army as a part of his attempt to impair the status of the Church of England, or perhaps as part of his followers’s destruction of property of those loyal to King Edward I. As noted above, the Framptons have remained to this day as patrons of the manor church, and in 1655 the Framptons rebuilt the St. Nicholas Church. In 1704, the Framptons sold the Manor and its demesnes to Joseph Darner, Joseph Damer, Lord of Milton and Earl of Dorchester. He gave the Manor to his son John. John married Anne Seymour Conway. Anne Conway was a sculptress of considerable talent (notable are a bust of Admiral Nelson (now in the City of London Guildhall) given by her to Napoleon; and a bust of Queen Caroline whom she befriended during her the infamous trial following the bogus adultery charge leveled by King George IV of Great Britain at his wife, when she refused the King’s demand that she renounce her title and live abroad.) There is a statue of Anne Conway in the British Museum. In 1790, after the death of her husband, Anne Conway built a new west wing to the Manor. Subsequently, the Manor passed to her sister-in-law, Lady Caroline Damer. In 1825, Lady Caroline Damer sold it The Revd. W. R. H. Churchill (relative of the Duke of Marlborough and Sir Winston), in whose family the Manor (although not the manor house and other various portions of the Manor) still remains. The Churchills owned the manor house until the late 1800’s. It is the Churchill crest that is over the front door of the manor house. In the 1900’s the Manor and its included properties became fragmented. Several parts are now in separate ownership and many of the ancillary buildings have been demolished. In 1964 ownership of the manor house passed from Canon H W M Hearsey to Mr. and Mrs. P W Mummery. From 1976 until 2006, the manor house was owned by Major and Mrs. Derek. “To approach and enter Buckland Ripers on foot [by the public footpaths from Radipole] is seemly, for this is a precious place and even one car in the deep dell an anachronism.” Eric Ricketts, The Buildings of Old Weymouth, Part Three, p. 63 (1977). We recommend to you the poetry of Winifred Margaret Clary. The Clarys held the ancient Manor House of Buckland – Ripers from _____ until 2006. She was greatly interested in the ancient history of Buckland – Ripers and its probable early association with the Roman use of nearby Radipole (then known as “Wey”). Many of Mrs. Clary’s poems evoke well the images of life in England, especially from the viewpoint of the persons living in the manor house. One of those poems, entitled “The ‘Spun Yarn’ of Bucklin Ripers” is especially moving when you read it near the manor house.